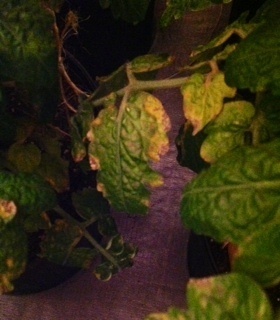 Tomato plant fungus or deficiency? My daughter is growing cherry tomatoes indoors with magnets for a science fair experiment. 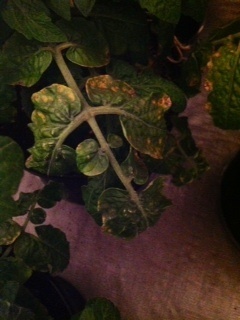 Most of the plants have leaves that are turning yellow and have brown spots. Her teacher said it was a deficiency, but we used miracle grow soil. wondering if it is a fungus. I would appreciate any insight as to how to save these plants. Also, we are using a 1000 watt high pressure sodium light that's is on for 16 1/2 hrs each day and temp in the room averages 82 degrees.